BOAO: Economic and trade exchanges between the Chinese mainland and Taiwan face a historic opportunity, Hu Jintao, general secretary of the Communist Party of China Central Committee, said at the Boao Forum for Asia. Hu made the remarks on Saturday while meeting with Vincent Siew, chairman of the Taiwan-based Cross-Straits Common Market Foundation, a non-profit group that works to improve economic collaboration between Taiwan and the mainland. Hu said the mainland would continue promoting cross-Straits economic and cultural exchanges; make efforts to push forward negotiations on weekend charter flights and mainland tourists' travel to Taiwan; and step up efforts to restore cross-Straits negotiations. He said cross-Straits economic exchanges and cooperation had achieved great progress after 20 years of development but pointed out that in the last eight years, relations "suffered twists and turns for reasons known to all", and people on both sides were not willing to see that. He stressed that the peaceful development of cross-Straits relations was the shared will and common interests of compatriots on both sides. Hu said the fact that the forum attracted so many participants from both home and abroad reflects Asian countries' and regions' strong desire to reinforce communication and cooperation and seek win-win solutions. "The fact also inspired us to think deep about cross-Straits economic exchanges and cooperation under the new circumstances," Hu said. Siew said the economies of the mainland and Taiwan are closely related, and the development of trade and economic relations had contributed to cross-Straits stability. He hoped weekend charter flights would be launched as early as possible and mainland tourists soon travel to Taiwan. At a roundtable yesterday, Siew introduced to Minister of Commerce Chen Deming 12 major infrastructure projects on the island which will be open to investment from the mainland. The projects, with a total investment of 250 billion yuan, are expected to give a boost to Taiwan's economy. "Our enterprises are keen to invest in Taiwan and participate in the projects," said Chen. "We hope Taiwan opens up to mainland investment and products as we have done over the years." Mainland enterprises are currently not allowed to establish operations in Taiwan, nor can their products be sold. "As long as it's in the interest of Taiwan people and will not impact on the island's enterprises, we can select mainland products to be sold in Taiwan," Chen said. 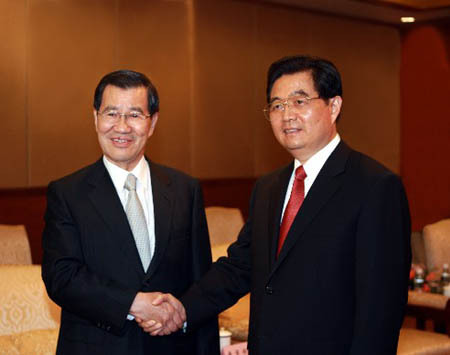 "The economies of the Chinese mainland and Taiwan are complementary to each other. Once our industries integrate, the potential will be enormous," said Morris Chang, chairman of Taiwan Semiconductor Manufacturing Corporation. Chang is among Taiwan executives who attended the forum yesterday, and his company is one of the world's largest semiconductor makers, which has a manufacturing facility in Shanghai.